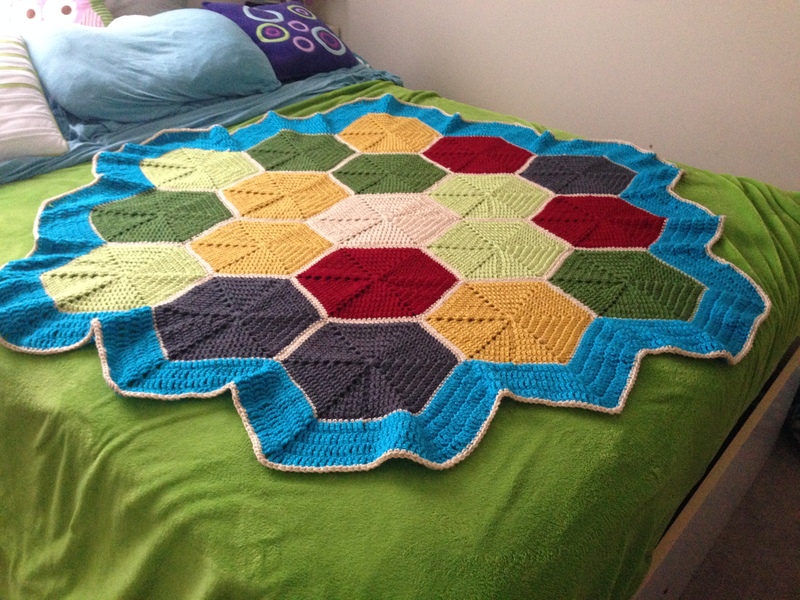 I made a blanket designed to look like my favorite board game, Settlers of Catan. 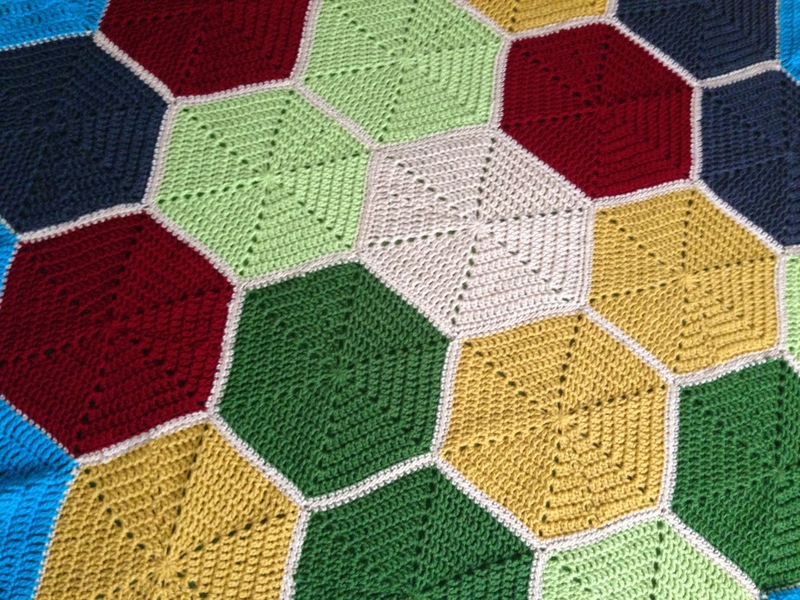 It is based on a pattern I found for a hexagon table runner, designed by Marinke Slump and available on Tuts+. Here I’ll tell you how to make it, but most of the credit goes to Marinke for this one. Make 19 hexagons using Marinke Slump’s hexagon pattern. But instead of 4 rounds per hex, do 8. This depends on how big you want your blanket to be. If I were to make this again, I’d probably do 9 rounds. 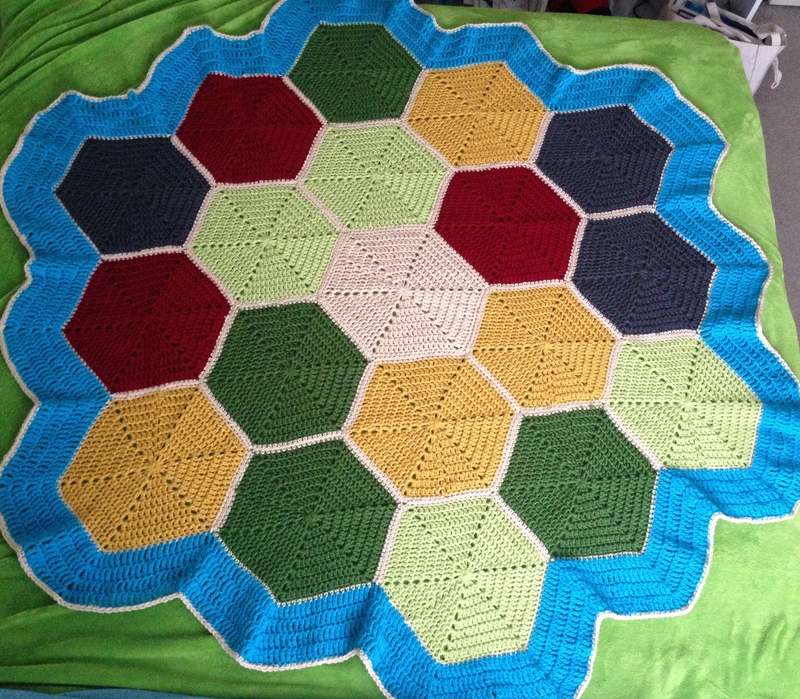 With 8 rounds per hexagon, my blanket covers most of my queen-sized bed. Around the edge of each hex, do a round of beige single crochets. When you get to a corner, sc in the first ch, ch 1, sc in the second ch. At the end of the round, finish with a slip stitch. Now’s a good time to stop and weave in some ends. Now that you have all of your hexes, arrange them however you want and sew them together. I used a simple whipstitch and the beige yarn. Start anywhere on the edge of your blanket. With the aqua yarn, ch 4. Tc around the whole blanket. When you get to a “valley,” tc two stitches together, one from the corner of each hex. When you get to a corner, tc in the chain space, ch 1, and tc in the chain space again. Make three more rounds of tc stitches around your blanket. The corners are the same, but when you get to a “valley,” you will tc three stitches together (taken directly from the table runner pattern linked above): *yarn over twice, insert hook into next stitch, yarn over, pull up a loop, (yarn over, draw through 2 loops) twice, repeat from * two more times, yarn over, draw through all loops on hook. You’re crocheting 3 treble crochet stitches together with this stitch. Make sure the middle stitch goes through the center single crochet in the valley from the previous round. Once you have four tc rounds, finish with a round of sc stitches in beige. This entry was posted in Crochet and tagged afghan, blanket, catan, crochet, free, hexagon, settlers. Bookmark the permalink.